From stunning black glass and sparking crystal to rich shades of amber and amethyst, vintage glass cameos are highly sought after by many jewelry collectors. Glass cameos were first made by the Egyptians and the people of Ur over 5,000 years ago. Throughout the following decades glass making techniques were improved by various cultures including the Mycenaean, Greek and Roman. Writings by the Roman scholar Pliny from the first century A.D. are referenced in the book Cameos Old and New by Anna Miller. Pliny tells how glass cameos were the costume jewelry of the day and explains that they were very popular with people that could not afford the real engraved stone cameos. The ancient methods of pouring hot molten glass into a clay intaglio and carefully pressing it into place has been modified through the centuries. 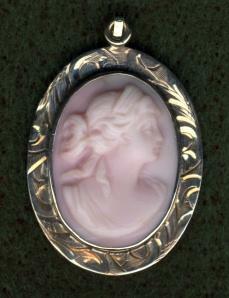 Vintage cameos and those of today are still made using clay intaglio molds. The hot glass is then squeezed into the mold and another glass, usually a different color, is pressed onto it as a contrasting back color. Once the glass has cooled, it is removed from the mold and is either finished by hand or machine. Many vintage cameos are made of more then one color glass to resemble carved sardonyx cameos. These glass cameos are made using a method of layering the glass and lamenting them together with fusion or binding them with glue. Many times the glass has a beautiful swirled effect. Having a glassblower layer different colors of glass which is then carved by an artist once it has cooled is another method of creating the look of sardonyx. 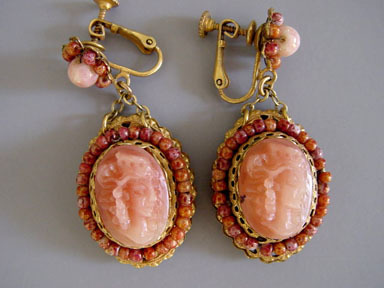 Many vintage jewelry collectors of today search for glass cameos. These exquisite jewelry pieces were made in many different colors, styles and sizes. Glass cameos reached the pinnacle of their popularity in the 1960s when they were being produced by famous designers and companies including Whiting and Davis, Warner, Bellini and Hobe. During this time glass cameos were also produced by many lesser known designers and companies resulting in many surviving pieces being unmarked. Since very few vintage glass cameos were carved, check for signs of mold lines. Turn the cameo over and look carefully on the back for dimples, ridges and mold marks. Molded cameos generally have details that appear rounder and the details and lines are not as sharp and seem less defined. Plastic and resin vintage cameos were also molded and show the same characteristics. With experience you will be able to tell the difference in the feel of the different molded materials. Glass cameos also appear much more shiny then plastic and resin. The following are examples of some of the beautiful vintage cameos of glass. Whether you are a vintage jewelry collector, a cameo collector or simply enjoy wearing vintage glass cameos, you are certain to enjoy the timeless beauty of this classic style..